It was not November but October. The hosts provided a lot of wild turkey, but it was not the main dish. That was venison, courtesy of five deer brought by the guests. There were about 50 Pilgrims and some 90 Native Americans. 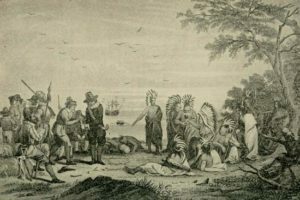 The Wampanoag took pity on the Pilgrims, knowing that their first winter had been devastating – almost 50% casualties to sickness and lack of food. In the spring, they showed the Pilgrims how to plant corn, and everyone celebrated a successful harvest before the beginning of the Pilgrim’s second winter. This was the meal that became so famous, but the first official Thanksgiving came two years later, in 1623. 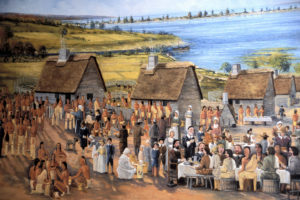 The traditional Thanksgiving Dinner replicates many of the dishes of the 1621 meal. Turkey gets the place of honor, with gravy, cranberries, and mashed potatoes sharing the table. Turnips are not so popular, and the farther one gets from New England, the more creative the side dishes and condiments become, but pumpkin pie continues to hold its own. Whatever your choice, eat away! 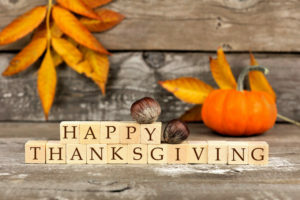 And Happy official 394th Thanksgiving! 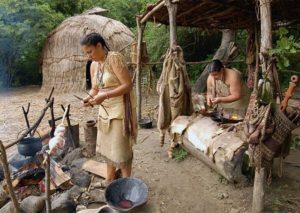 It’s inhumane, what the Wampanoag got in return for their empathy and humane actions. Europeans are heathens. We should not be proud of the European portion of our heritage. And certainly not proud of the uncivilized heathen who managed to steal so much from everyone around him, and the election.